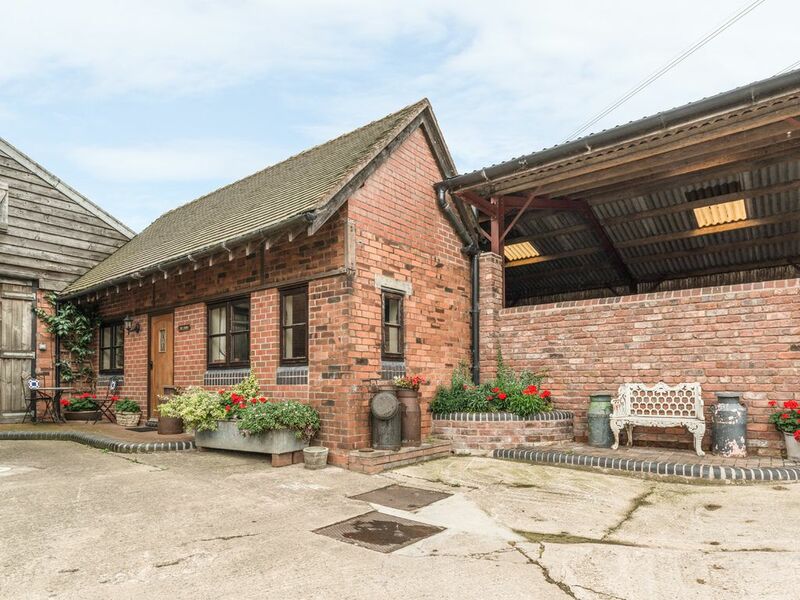 This delightful, brick-built semi-detached barn conversion has been thoughtfully renovated to provide a romantic retreat for two people that is both characterful and comfortable. The accommodation is all on ground level and the living space is open plan. The cosy lounge area has a log effect electric stove and makes the room an inviting space, whilst the modern kitchen is well equipped and has a charming dining area. The tastefully decorated bedroom is spacious and elegant and has the advantage of an en-suite shower room. Outside the property is a small courtyard to the front with furniture and views across to the Long Mountain. With some of the original beams and exposed stonework still in place, this is a beautiful property from which to enjoy this wonderful area. Amenities: Wall mounted (instant heat) electric convector heaters plus electric stove in sitting area. Electric oven and hob, microwave, fridge, washing machine & tumble dryer in adjoining utility shed, flat screen TV, WiFi. Electricity inc. in rent. Bed linen and towels inc. in rent. Off road parking for one car. Bike storage. Small front courtyard with furniture and views towards the Long Mountain. Sorry, no pets and no smoking. Shop 3 miles. Pub 3.5 miles drive or 20 mins walk by footpath. Note: Babes-in-arms only. Note: Home baked farmhouse cake provided on arrival. Town: The village of Leighton goes back many centuries and is mentioned in the Domesday Book of 1087. It is only four miles from the World Heritage Site of Ironbridge, home of the world's first bridge to be constructed of iron, built between 1777 and 1779. The Ironbridge Gorge is situated in a beautiful wooded valley and the village of Leighton is home to a variety of public houses, restaurants, tea-rooms and shops, and a collection of separately themed locations make up the Ironbridge Museums. The National Trust Properties of Attingham Hall and Park are close by as well as the fascinating Wroxeter Roman City and Vineyard. With a wealth of historical attractions and a host of outdoor pursuits, this area has a lot to offer visitors at any time of year. All ground floor. One double bedroom with en-suite shower, basin and WC. Open plan living area with fitted kitchen, dining area and sitting area with log-effect electric stove. Wall mounted (instant heat) electric convector heaters plus electric stove in sitting area. Electric oven and hob, microwave, fridge, washing machine & tumble dryer in adjoining utility shed, flat screen TV, WiFi. Electricity inc. in rent. Bed linen and towels inc. in rent. Off road parking for one car. Bike storage. Small front courtyard with furniture and views towards the Long Mountain. Sorry, no pets and no smoking. Shop 3 miles. Pub 3.5 miles drive or 20 mins walk by footpath. Note: Babes-in-arms only. Note: Home baked farmhouse cake provided on arrival.